Thanks, Manisha. I can't wait to try this! Tea, once you get the hang of this, you can adjust it to your tastes. Sometimes, I add finely chopped red onion. Other times, I don't temper it with oil. 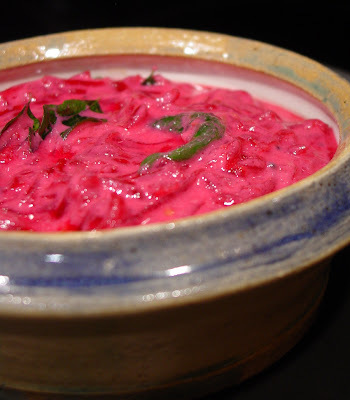 You can use cucumber (diced small) instead of beet, as another variation. When I make that I add lightly crushed roasted peanuts. Let me know how you liked it! I need to update this post with a picture. I think I have one somewhere. My grandma makes a version of this salad. I don't think that she uses ginger though. She boils the beets, then puts them in a blender for a few spins..not fully pureed ..a few chunks remain. I have bookmarked your blog for further reading. Are you a Konkani by any chance ?? I don't think we qualify to be Konkanis. We have roots in Goa as well as Kumta and Karwar. My generation of the family now has members from the length and breadth of the country! I'll look forward to your feedback on my recipes! Yes, for sure. I will be looking at your website for tips and tricks. I am always trying out recipes and am really passionate about food. I enjoy cooking and feeding people. Asha, 3 months is indeed a long time but that way back was in 2004. :-D I just switched to the new Blogger so this post probably showed up as 'new' in the RSS feed. Sorry if that was confusing but I don't have any control over it! You have a great 2007! That was confusing all right...but you have been busy again methinks!! Was happy to see a 'new' post though! Til gul ghya ani god god bola! My aunt's sending me some of her to-die for tilache ladu! Yay! It is chock full of nutrients and can be used in the place of Spinach. The leaves are incredibly rich in nutrients, concentrated in vitamins and minerals as well as carotenoids such as beta-carotene and lutein/zeaxanthin. 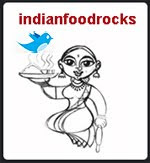 Hi Manisha JI, Wonderful website and awesome recipes. I saw this beet root recipe and i exactly do this with carrots but didn't know about yogurt. I just add the tadka + green chillies+ grated carrots+ Lime juice . Will try the beets for now. Also wanted to share that since Beets has iron and milk or milk products slows the absorption of iron if taken with iron foods /tablets .so in order to utilize maximum iron from beets ,yogurt might not be a good idea. For just taste sake yogurt sounds great ! !